From the thrilling whitewater of rivers like the Rogue and Clackamas to the serene beauty of the Klamath Basin wetlands, Oregon's waters are an important part of what makes our state a special place to live, work and raise a family. Pristine watersheds are vital for fish, wildlife and humans. Salmon, trout and steelhead need cool, clear streams and rivers for spawning; wildlife depends on our wetlands, rivers and lakes for vital habitat and sources of food; and our friends, family, and neighbors in communities across the state depend on forest watersheds for pure drinking water. Oregon Wild has worked for decades to protect our state's rivers, lakes and wetlands from dam building, reckless logging, mining, and runaway development. From our winning campaign to protect Portland's drinking water from logging, to our ongoing work to restore balance to the Klamath Basin and protect Oregon's waterways from the damage incurred by suction dredge mining, Oregon Wild is the leading voice for common-sense conservation of our waters and the fish and wildlife that call them home. 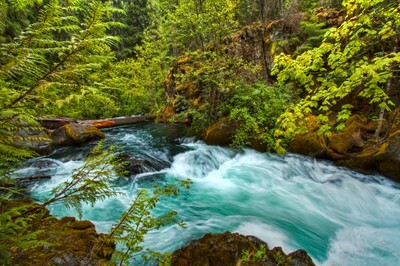 McKenzie River photo by Joel Zak. Umpqua River photo by Memoriee Sconce.